What shows up at O2 instead of DanielPipes.org. 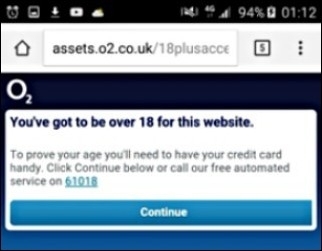 O2, the second-largest mobile telecommunications provider in the United Kingdom, has banned my website to anyone under 18 years of age. At right is what you find when you land on DanielPipes.org. The fine print reads: "To prove your age you'll need to have your credit card handy. Click Continue below or call our free automated service on 61018." In other words, you have to go to a lot of trouble to read or see my work, something presumably few casual internet surfers will bother to do. In contrast, O2 makes available without having to prove anything no end of Islamist and related websites, including such anti-Zionist delights as Al-Muntada Trust, the Palestinian Forum in Britain, and Friends of Al-Aqsa. O2 is a subsidiary of Telefónica, the giant Spanish multinational with annual revenues of over €50 billion and assets worth about €125 billion. So far as I can tell, no other division of Telefónica has banned me in this way. The response from O2 to Daniel Pipes' complaint about being censored. In response to this censorship, I resorted to the O2 complaint page on Nov. 3, Nov. 8, and Nov. 9, asking each time that it "immediately unlock my website." Each time, I received back an acknowledgment form but then heard nothing further. To put this incident in context: 2½ years ago, I had a similar problem when I learned that I was "Banned in the British Library," the country's national depository library, meaning that DanielPipes.org could not be accessed from that august institution. Happily, that time I could report a day later that I was "No Longer Banned in the British Library!" What is it about the British that they effectively ban a mainstream website encouraging them to protect their culture and country while allowing free rein to those that would tear it apart? November 14, 2016 Update: Twitter works. O2 ignored my direct complaints but paid attention to my tweet about the above article. Eleven hours later, O2 replied by tweet: "Hi Daniel, we'll get this reviewed and be back in touch as soon as possible. Thanks for all your patience." To which, I quickly replied in a tweet: "Thank you for quickly looking into this. Conservatives are not extremists, so age-blocking me harms your reputation & my readership."